Leon Camier claims Suzuki reneged on a deal for him to race for them in next year's World Superbike Championship. Suzuki have signed Eugene Laverty and Alex Lowes for 2014. Camier, 27, says he shook hands with team principal Paul Denning on an agreement and told BBC Radio Kent he has been "stabbed in the back". However Denning said in a statement that Camier had a "wayward interpretation" of negotiations and his perspective "doesn't mirror the facts". 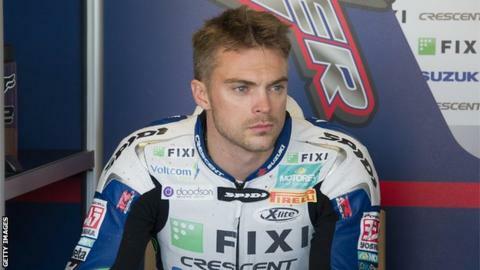 Kent rider Camier, the 2009 British Superbike champion, joined the Suzuki team for the 2012 season. He finished 14th in the championship last year and followed that with an 11th place finish in 2013. Camier claims a deal in principle had been agreed between the final round of the season in Jerez on 20 October and testing in the Spanish city on 30 October. "After the last race weekend, things kept dragging out," he said. "We made a rough agreement on the phone. We were both happy we were in the ballpark. "We got to the test, ironing out the details. I did the test. "I hadn't signed a contract but we'd agreed everything. We shook hands after the test. "Everything was nigh on finalised. All I had to do was sign a bit of paper. "As far as I was concerned everything was going ahead. I trusted that it was happening. "For all of a sudden for it not to happen was a real big kick in the nuts really." However Denning says negotiations had been drawn out by increased demands from Camier and his management team. Denning took the opportunity to sign Laverty, runner up in the 2013 championship, following a call from the Northern Irishman on 1 November. "There was not a new contract to sign," Denning said in a statement to BBC Radio Kent. "We were still negotiating when the Laverty opportunity arose. I would suggest that Leon's situation was one of unfortunate timing, bad luck to a large extent and procrastination on his and his management's behalf. "I had asked for more time, no handshake had been made." Denning described Camier as "a loyal, dedicated and popular rider" but that "professional sport is a brutal environment". Camier is now assessing his options, with a deal with Aprilia or a return to British superbikes among them. "I'm going to wait to find out what happens with the World Championships first with this Aprilia option, then try and judge how good the bike will be and go from there," he said. "The goal is to be world champion. I've just got to figure the best way to do it. "If that means going back to riding in the British Championships then so be it. Whatever I do, I want to be competitive. "If I do go back to British, I'll try and build a team around me that will be strong enough to challenge for podiums. "I've got to use my anger as motivation. I've just got to find out what the best opportunity is for me."